The former congresswoman has faced heavy criticism from UTEP students and local activists over her past voting record on LGBTQ rights, immigration, and federal Pell Grants. The University of Texas System Board of Regents unanimously voted for Wilson after selecting her as the sole finalist for the position on March 8. UTEP has an enrollment of around 25,000 students, about 80% of whom are Latino. "No institution means more to the future of El Paso and Juarez region than UTEP," Wilson said in an emailed statement following the final vote. "Its deep commitment to providing access to education and excellence in research is a model for the nation." Five people from the UTEP community, including two alum, and at least one professor, spoke against Wilson's nomination before the final vote. UT system spokeswoman Karen Adler said that Wilson met with students, faculty and staff on campus last week to discuss community concerns. Adler said the meetings were not open to the public to allow for candid conversation. Former UTEP student Eden Klein told the regents Wilson is unqualified for the position and would be harmful to the UTEP community. "Black and brown and LGBTQ students and employees will never feel safe on a campus knowing they are being presided over by someone who has consistently voted against them," Klein said. Regents Chairman Kevin Eltife said the board reviewed Wilson's qualifications and past performance throughout her career. "Colleagues who worked with Dr. Wilson during her tenure as a university president, member of Congress and the secretary of the U.S. Air Force, regardless of political party, commended her for her impressive leadership, inclusivity, laser-sharp strategy, focus and compassion and treatment of all with whom she worked," Eltife said. Brian Hernandez, a UTEP senior engineering student selling raffle tickets at a booth for a Latino-focused fraternity, said the administration did not adequately involve students in the selection process and "when students started protesting, it was already late in the game." Wilson will replace Diana Natalicio, who has served as UTEP president for three decades. 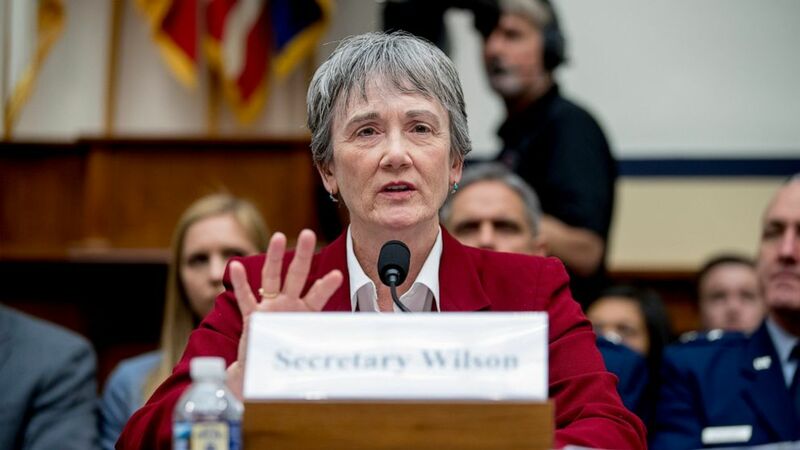 Wilson will resign from the Air Force at the end of May and start her new position in mid-August. Associated Press reporter Cesar Attanasio in El Paso contributed to this report.